Suggested Use: Take 1 to 2 capsules daily or as directed by a health care professional. regenerating vitamin E molecules that have been deactivated by over-oxidized fats. Ubiquinones are believed to be present in the outer and internal membranes of all aerobic organisms — plants, animals and many kinds of bacteria. CoQ10 is the predominant ubiquinone in most mammalian species, although CoQ9 predominates in rats and mice. The numeral in the name refers to the number of subunits in the molecule’s side-chain. The production of energy (in the form of energy storage molecules known as “ATP”) would immediately and drastically decline throughout your body. Your cells would soon use up their existing supplies of ATP. Without energy from ATP, your cells would be unable to replace the enzymes and other molecular structures that normally undergo a continual process of repair or replacement, both inside and outside of the cells. With no CoQ10 to neutralize oxygen radicals, tissue destruction would accelerate. You would soon weaken, fall into a coma, and die. Many medical conditions can increase your need for CoQ10, yet your body is unlikely to respond appropriately. Certain medical conditions can reduce your body’s CoQ10 production. Certain genetic defects can result in chronic CoQ10 deficiency. Because CoQ10 plays such a fundamental role in the viability of cells, your body’s failure to produce enough CoQ10 can have debilitating consequences in a wide range of situations. 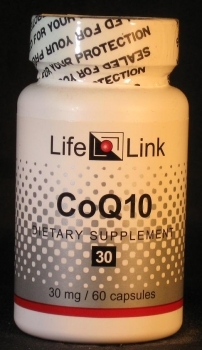 In humans the body’s peak value of CoQ10 production occurs at around 20 years of age;3 then the production declines continuously, leaving older people in a sorry state of affairs. Furthermore, CoQ10 levels are severely depleted by many medications, including beta-blockers and statins. Statins inhibit CoQ10 production to the degree that patients can experience muscle pain and wasting, heart disease, liver damage, kidney failure, fatigue, and cancer. Mol Syndromol. Jul 2014; 5(3-4): 187–197. Coenzyme Q10 Therapy Juan Garrido-Maraver, et al. Regul Toxicol Pharmacol. 2006 Aug;45(3):282-8. Epub 2006 Jun 30. Risk assessment for coenzyme Q10 (Ubiquinone). Hathcock JN, Shao A.
 Lipids. 1989 Jul;24(7):579-84. Age-related changes in the lipid compositions of rat and human tissues. Kalén A, Appelkvist EL, Dallner G.
 Behav Pharmacol. 2013 Aug 7. Chronic treatment with coenzyme Q10 reverses restraint stress-induced anhedonia and enhances brain mitochondrial respiratory chain and creatine kinase activities in rats. Aboul-Fotouh S.
 Mol Neurobiol. 2013 Dec;48(3):883-903. Coenzyme Q10 depletion in medical and neuropsychiatric disorders: potential repercussions and therapeutic implications. Morris G, Anderson G, Berk M, Maes M.
 Semin Pediatr Neurol. 2013 Sep;20(3):188-93. Mitochondrial dysfunction in migraine. Yorns WR Jr, Hardison HH. Biofactors. 2011 Sep-Oct;37(5):386-92. Mitochondrial dysfunction and Down’s syndrome: is there a role for coenzyme Q(10) ? Tiano L, Busciglio J.
 Nephrourol Mon. 2014 May 10;6(3):e16870. Ubiquinol effect on sperm parameters in subfertile men who have astheno-teratozoospermia with normal sperm concentration. Cakiroglu B, Eyyupoglu SE, Gozukucuk R, Uyanik BS. Indian J Pharmacol. 2010 Dec;42(6):334-7. Role of coenzyme Q(10) as an antioxidant and bioenergizer in periodontal diseases. Prakash S, Sunitha J, Hans M.
 Diabetologia. 2002 Mar;45(3):420-6. Coenzyme Q(10) improves endothelial dysfunction of the brachial artery in Type II diabetes mellitus. Watts GF, Playford DA, Croft KD, Ward NC, Mori TA, Burke V.
 J Diabetes Complications. 2012 Jul-Aug;26(4):352-8. The effect of ubiquinone in diabetic polyneuropathy: a randomized double-blind placebo-controlled study. Hernández-Ojeda J, Cardona-Muñoz EG, Román-Pintos LM, Troyo-Sanromán R, Ortiz-Lazareno PC, Cárdenas-Meza MA, Pascoe-González S,Miranda-Díaz AG. J Neurol Sci. 2006 Jul 15;246(1-2):153-8. Cerebellar ataxia with coenzyme Q10 deficiency: diagnosis and follow-up after coenzyme Q10 supplementation. Artuch R, Brea-Calvo G, Briones P, Aracil A, Galván M, Espinós C, Corral J, Volpini V, Ribes A, Andreu AL, Palau F, Sánchez-Alcázar JA, Navas P,Pineda M.
 Nutrition. 2012 Mar;28(3):250-5. Coenzyme Q10 supplementation reduces oxidative stress and increases antioxidant enzyme activity in patients with coronary artery disease. Lee BJ, Huang YC, Chen SJ, Lin PT. J Hum Hypertens. 2007 Apr;21(4):297-306. Coenzyme Q10 in the treatment of hypertension: a meta-analysis of the clinical trials. Rosenfeldt FL1, Haas SJ, Krum H, Hadj A, Ng K, Leong JY, Watts GF. Mol Aspects Med. 1994;15 Suppl:s231-40. Apparent partial remission of breast cancer in ‘high risk’ patients supplemented with nutritional antioxidants, essential fatty acids and coenzyme Q10. Lockwood K, Moesgaard S, Hanioka T, Folkers K.